Stylized lithium-7 atom: 3 protons, 4 neutrons, & 3 electrons (tot electrons are ~1/4300th o the mass o the nucleus). It haes a mass o 7.016 u. Rare lithium-6 (mass o 6.015 u) haes anly 3 neutrons, reducin the atomic wicht (average) o lithium tae 6.941. 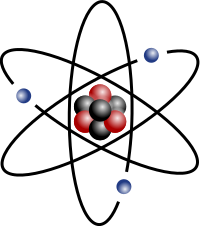 The atomic mass (ma) is the mass o an atomic pairticle, sub-atomic pairticle, or molecule.